Aries is a diurnal cardinal fire sign ruled by Mars, which means that a person born when the Sun was in Aries individuates themselves in a way that is characteristic of Mars – bold, brave, fiery. The sign of the warrior, the soldier, the athlete. They’re brash, bold and ballsy, brave, brilliant and boisterous. The Sun in Aries is associated with leadership qualities, known for being courageous, quick to anger, rough-and-tumble, tough. 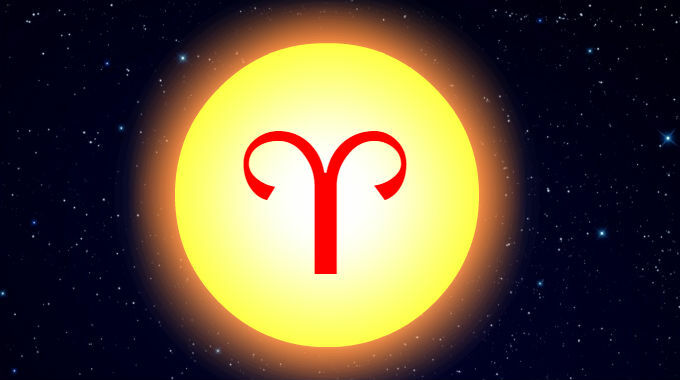 The Sun is exalted in Aries due to being the most diurnal sign in a diurnal relationship to its home sign of Leo, so solar qualities of identity and pride are supported and distinctly expressed. Aries is probably the most macho of all the signs, overrepresented in fields like the military, law enforcement, firefighting, competitive sports. They’re headstrong people who like danger and have a need for speed, they like working with cars and metal and they love the thrill of the hunt and they love to win. Basically, anything that helps them feel like they’re tough and top dog is going to be something that appeals to an Aries. Aries is associated with the head, so sometimes Aries Suns tend to walk with their head forward, sustaining injuries to their head or appear with distinctive baldness or scarring. The Sun is in Aries when Passover and Easter are celebrated, two holidays which are both associated with freedom and renewal through the slaughter of “lambs”. The image of Aries is a ram. This is all especially true if you were born during the day and/or with Aries or Leo Rising. If you were born at night, you may identify more with your Moon sign.